I discovered this DELICIOUS combo when I was combining leftovers for a lunch. 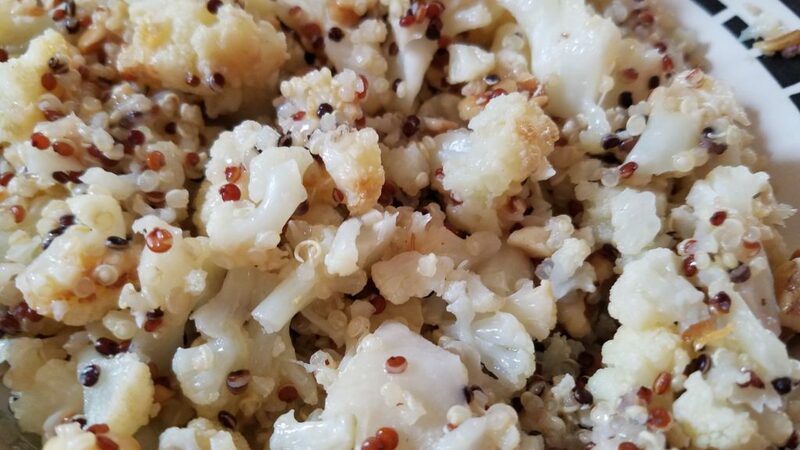 I had leftover Garlic Lemon Parmesan Roasted Cauliflower, cooked quinoa, and some of the toasted seasoned walnuts from this Arugula, Chickpea, Walnut, Fig, Goat Cheese salad recipe. Mixed them together in a bowl and heated in the microwave. One bite is all it took to realize I had to turn this into a “recipe” and recreate it time and time again! These can be served right away, at room temperature or chilled. Put 1 cup water in a large saucepan. Add the beans, cover and cook until tender but still very crisp, about 6 minutes. Whisk together Sherry vinegar, lemon juice, Dijon mustard, and 3 tablespoons olive oil in a large bowl. Drain the beans in a colander, transfer to bowl with the vinaigrette and toss to coat. Season to taste with salt and pepper. This gorgeous and flavorful salad is packed with nutrition! Arugula is a low-calorie, nutrient dense leafy green. A full cup of arugula contains just five calories, contains vitamin A which helps maintain eye health, and it provides 21.7 milligrams of brain-boosting, bone-building vitamin K. Vitamin C and several of the B vitamins can also be found in arugula, giving it even more nutritional benefits. Arugula is also high in antioxidant phytochemicals that boost health. Figs are rich in polyphenols. (A micronutrient that contain health-promoting properties found in plant foods. Plant polyphenols are rich in antioxidants, which help decrease oxidative stress). And figs are high in fiber. Just a half-cup of dried figs packs in more than 7 grams of dietary fiber. Here is a recipe for a delicious sauce made with figs. Goat Cheese is a hypoallergenic alternative for those allergic to cheese made from cow’s milk. Goat cheese is a low-fat alternative to regular cheese. Has lower sodium levels than other types of cheese. Walnuts are rich in antioxidants. Super plant source of omega-3s. May decrease inflammation. Promotes a healthy gut. May reduce risk of some cancers. Supports weight control. May help manage type 2 diabetes and lower your risk. May help lower blood pressure. Extra Virgin Olive Oil is a rich source of antioxidants and monounsaturated fats, both of which are thought to protective cardiovascular health partly because of its well-documented anti-inflammatory properties. There is plenty of protein in this salad to make it a hearty meatless main and interesting enough to dress up a simple grilled fish or chicken entrée. 3 ounces goat cheese, crumbled (about 3/4 cup) (Put in freezer for 5 minutes, using a fork, pull the cheese apart into crumbles. Preheat oven to 350°F. Toss together walnuts, oil, cayenne, and salt on a small baking sheet. Bake until golden, about 8 minutes. Check on them every couple minutes to make sure they do not burn. Remove from oven, and set aside. Whisk together balsamic vinegar, honey, olive oil, and 3/4 teaspoon salt in a small bowl. 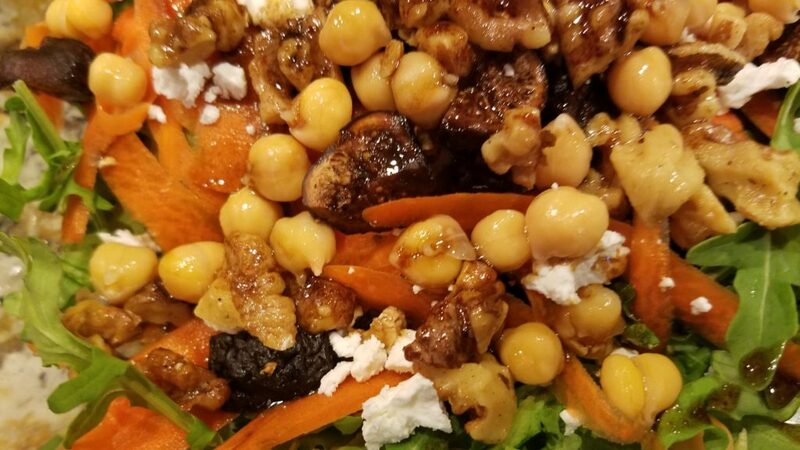 In a large salad bowl, place arugula, chickpeas, figs, and carrot. Top with dressing and toss to evenly coat vegetables. To serve, divide salad on each of 4 bowls; top with goat cheese and walnuts.